The Facility is closed on weekends and all County Holidays. An inmate may place any one on their visiting list that benefits them during their stay at the Facility. Family, friends and counsel, both legal and religious are generally accepted. However, any person that does not contribute to the inmate’s rehabilitation will not be admitted. This includes any person that is on probation or parole, falsely represents themselves, is disruptive, has no legitimate purpose for visiting, or is believed by the Facility to contribute to the inmates behaviors that caused them to be incarcerated. All visitors must arrive before 11:00, 4:00 and 7:30 so that we can ensure that you receive the half hour visit. Inmates may receive two, thirty minute visits per week. These may be combined into one, sixty minute visit at the inmate’s request and the discretion of the Officer and Visitor Receptionist. As a visitor, your name must appear on the approved visitor list or you will not be admitted. Valid photo identification for adults (any person over sixteen years of age) is required. We will only accept a driver’s license, Department of Transportation identification or other photo government identification. NO EXCEPTIONS. Nothing may be taken into the Facility. 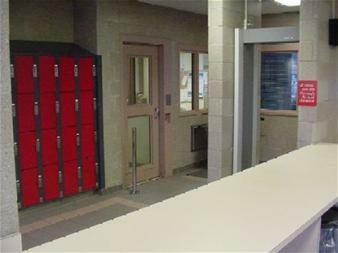 Lockers are provided to secure your personal items. Jackets, coats and any other outer garment must be placed in the locker. If it will not fit in a locker, you must return it to your vehicle. Visitors may not wear a hat or cover their head while in the facility. They also may not have a hat or any type of head covering in their possession while in the Facility. The County is not responsible for any lost or stolen items. Visitors are encouraged to leave anything of value at home. All visitors and their possessions are subject to search at anytime. No weapon, tool or anything that could be used as a weapon or tool is allowed in the Facility or lobby at any time. Official, law enforcement visitors must secure all weapons in the secure locker in the entry vestibule. All visitors must be able to pass through the metal detector without activating the warning. If you can not pass, you will not be admitted or may be required to submit to a clothed search before being admitted to the Facility. Any visitor under the age of eighteen (18) must be accompanied by their parent or legal guardian. The child must be kept with the parent at all times, no further than an arms length away. The child must remain seated and under control at all times. If the child is running around, is not in reach of the parent or becomes disruptive at anytime, the visitor will be required to leave the Facility. Money can be deposited on an inmate’s account in 3 ways: in the Lobby Kiosk which accepts cash, visa or mastercard: on the web at accesscorrections.com which accepts visa or mastercard: or by phone at 1-866-345-1884 which accepts visa or mastercard. As of October 8, 2013, money orders will no longer be accepted through the window at WCCF. Clothing must be mailed in their original store bought, unopened package and must be clearly marked “personal clothing”. Also, be sure that the inmate does not already have their allotment of personal clothing. They are allowed seven (7) pairs of white socks, seven (7) white T-shirts (no pockets or long sleeves), seven pairs of underpants, seven (7) bras (no under wire or metal stays) female only, and one pair of white thermal underwear. They are also permitted to keep one (1) set of court clothes in storage if they are to be tried by jury only. If the package contains anything other than those items permitted or the inmate already has their allotment, the contents will be donated to a charitable organization. Any package not clearly marked “Personal Clothing” will be refused. THE FACILITY WILL NO LONGER BE ACCEPTING MONEY ORDERS OR CERTIFIED CHECKS. (See rule #13) This also includes stamps, paper and envelopes. The inmate may purchase these from the commissary. Reading material will only be accepted from the publisher by prepaid subscription or that has been directly shipped from a book supplier or store approved by Administration. Clothing will only be accepted through the mail as described in rule #14. WHAT AN INMATE MAY RELEASE TO A VISITOR. GENERALLY THE FACILITY DOES NOT RELEASE ANYTHING. Inmates may request to release certain items or funds. If it is found to be a legitimate request, we will consider it. This is generally only granted when keys are needed, or an emergency exists pertaining to the inmate and their commitments outside the Facility. Each request is considered on a case by case basis. You must be present to check on a property release. Due to the paper work needed to protect inmates and their funds, Property will only be released at the following times: Funds and/or Personal items: Monday thru Friday 11:00 a.m. to 11:30 a.m. Personal Items Only: Monday thru Friday 6:00 p.m. to 7:30 p.m. Visitors must maintain the highest level of behavior at all times. Yelling, cursing or becoming disruptive in any way will cause you to lose your visiting privileges. Attempting to communicate with any inmate other than in a visiting booth is not permitted. Standing, loitering, waving, yelling, etc. anywhere around the Facility is not permitted and will cause you to lose your visiting privileges. The use or possession of any tobacco product and associated devices is strictly prohibited in any area of the Washington County Correctional Facility, the adjoining buildings and grounds. All of these items must remain at home or locked in your vehicle. Any visitor that violates any of these rules will be required to leave the Facility and the surrounding grounds and will not be permitted to return. The inmates are depending on you to protect their visits and to provide them with support during their stay here. Don’t let them down. Is the U.S. bail system unfair? How do bail bonds help Jail overcrowding? What Happens at a Bond Hearing? What happens when a person is arrested? What Are the Benefits of Being a Bail Bondsman? Do I Get My Bail Bond Money Back?